I love memes and my favorites are always the ones The Church of Jesus Christ of Latter-day Saints create during/after their bi-annual #LDSconf or General Conference. I'm grateful for the many people who work to design those, it really looks like they try and find the best pictures to match or complete each quote they choose to share so that it can continue to inspire us on a daily basis! These are perfect to share with the sisters you Visit Teach or families you Home Teach so click below to be taken to the memes where you can download them in different resolutions to either share online or print to share it. 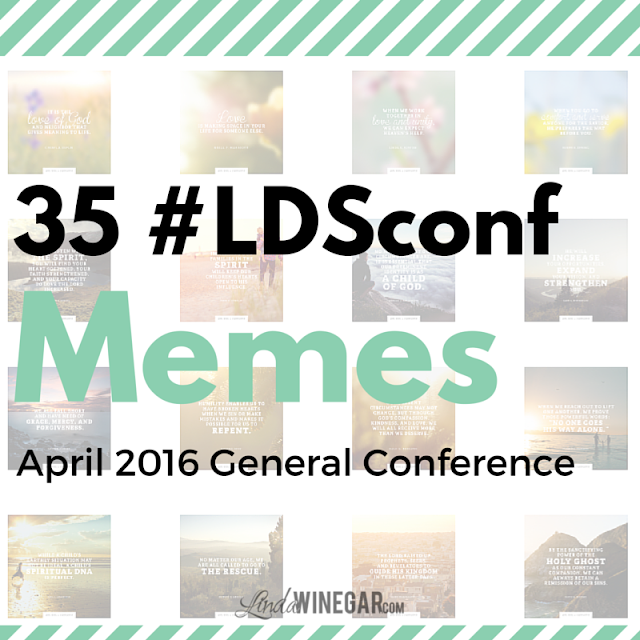 Click here or click the image to view all of the #LDSConf Memes from April 2016 General Conference messages. They even have 20 Memes in SPANISH & 20 Memes in PORTUGUESE! Remember to #ShareGoodness & enjoy!